This year more than one-third of college students (7.6 million), in traditional four-year undergraduate programs, are adults. That staggering number is expected to grow by an additional 8 percent by the year 2026. This vast section of the university demographic speaks to the undeniable importance of a college degree and the necessity it has become to advance your professional career, protect your job, and find satisfaction and meaning in your work. Returning to college to complete your degree takes courage, dedication, and hard work. Many adult students are now seeking to earn their four-year degree after having to take a break from undergraduate education to focus on work, finances, family, health, and other life events. No matter the reason you had to pause your education, it’s incredibly exciting that you have a desire to complete your bachelor’s degree! The degree completion programs at Neumann University (NU) are specifically designed with your needs in mind and are tailored to help you succeed in completing your degree efficiently and affordably. Read on to learn more about what our degree completion options specifically entail and how it can help you to advance your career and accomplish your goals. Feeling Busy? We Get That. Many adults considering a degree completion option often wonder: Can I work while completing my degree? In short? 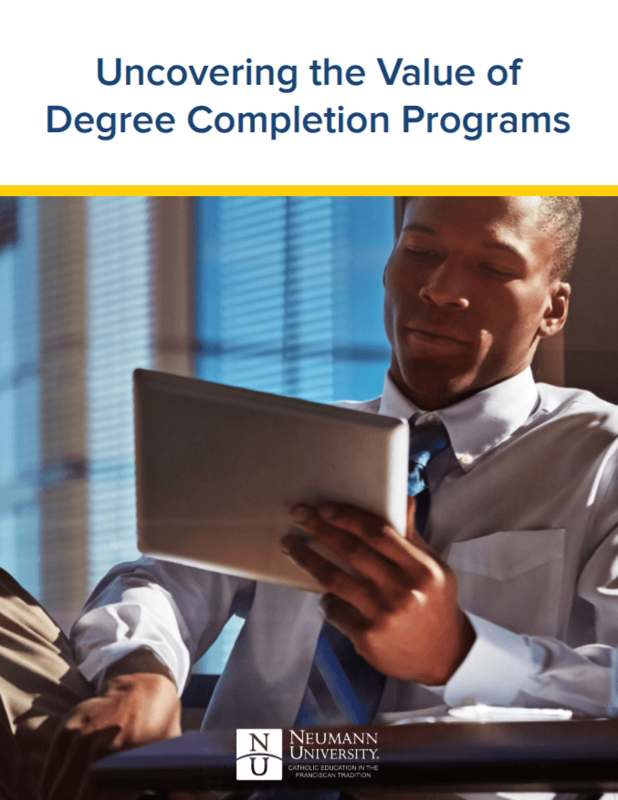 Yes, the degree completion program is designed to fit into a busy professional schedule. Students seeking the degree completion option are often compelled to continue working to pay for their education and to support themselves and their families. The on-the-job experience is also one of the factors that makes these students highly motivated, real-world learners, who can draw on their practical and professional experience to help them complete their degree. At Neumann University, our Faculty designed our degree completion programs specifically to work for adult students, who also have full-time jobs. We have customized these programs to be the most convenient and affordable option for returning to school to earn your undergraduate degree, and we are committed to providing a supportive environment to every student who joins us. The bottom line is this: Degree completion programs are designed for working professionals, who are seeking to complete a four-year undergraduate degree and who may or may not have already-completed college credit. Because you are a working professional — with obligations and expectations and not a lot of time to spare — the degree completion programs at NU have been optimized to be the most effective use of both your money and time. The research is overwhelming: Holding a four-year degree is important for professional advancement. When weighing the value of a high school diploma or some college credit, against a four-year degree, research is clear that an undergraduate degree outperforms in every area of consideration. Now, the most common objection to a traditional undergraduate degree is the cost. While this is a significant factor, and one that must be considered carefully, the ROI and value of a four-year degree only continues to increase. If you are set on returning to school to complete your undergraduate degree but are hesitating because of the cost or uncertainty about how it will fit into your busy schedule — financially, there isn’t a better time to jump than now! 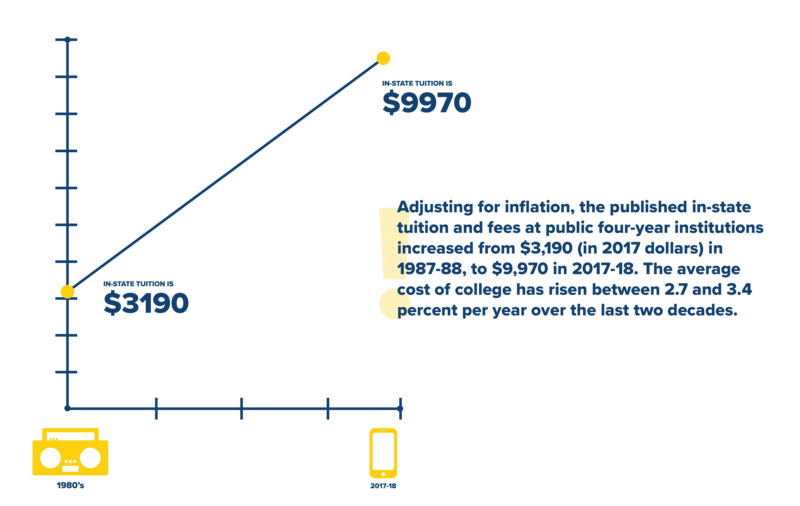 According to the report Trends in College Pricing 2017 that was put out by CollegeBoard, the cost of tuition at a four-year institution (public or private) is increasing and is projected to continue doing so. Adjusting for inflation, the published in-state tuition and fees at public four-year institutions increased from $3,190 (in 2017 dollars) in 1987-88, to $9,970 in 2017-18. The average cost of college has risen between 2.7 and 3.4 percent per year over the last two decades, and although that doesn’t seem like a big number, but when added up over time, it makes a huge difference. This increase outpaces both inflation and increases in median family income. If you are committed to returning to school for your degree, now is the best time to do so. By choosing to return to school now, as opposed to waiting a few years, you can potentially save thousands of dollars! A four-year degree can add significant value to your job outlook and career satisfaction. Read on to learn how completing your undergraduate degree can help you land a better job, with greater security, an opportunity for mobility, higher pay, and more satisfaction. When it comes to the number and quality of jobs that are open to graduates, the amount of education that you have makes a difference. College graduates are dominating the economy, as a growing percentage of workers hold college degrees. Candidates who hold a four-year undergraduate degree are more likely to be hired over those who have an associates degree. Earning your undergraduate degree provides you with the skills and experience that employers desire, while also demonstrating to a potential boss that you are hardworking, dedicated, and ambitious. Additionally, graduates of four-year degree programs are eligible to apply for far more jobs than those possessing an associates degree. Almost universally, a bachelor’s degree is a common prerequisite on job applications. Undergraduate degrees also open up doors to better quality jobs, with higher pay and more desirable benefits. Getting a job is just part of the equation, keeping that job is another topic altogether. According to the Bureau of Labor Statistics (BLS), those who hold an undergraduate degree earn more and are less likely to be unemployed than those with an associates. If a company experiences a difficult financial period or is going through an economic recession, employees possessing higher college degrees are often thought of as more valuable and are therefore, less likely to be laid off. Take for example, the recent Great Recession. Of the 7.2 million jobs lost between December 2007 and January 2010, 5.6 million were for workers with no more than high school diplomas. When 11.6 million jobs were created following the Great Recession, 8.4 million went to those holding a bachelor’s degree, while only 3.1 million went to those with an associates degree and 80,000 to those holding a high school diploma. Earning an undergraduate degree can not only help you secure a job post-graduation, but it can also lead to promotions and further career advancement within the employee’s current industry. When the opportunity for a promotion occurs, having an undergraduate degree can place you above competitors that only hold an associates degree or a high school diploma. Having a four-year degree is also incredibly important for those considering making a career change. Frequently when hiring, companies don’t require an undergraduate degree in the specific field, so long as you have related experience and can demonstrate that you possess the necessary skills. If you are looking to change careers or job positions, an undergraduate degree is extremely valuable because it serves as a stepping stone into that new industry. Without a four-year degree (doesn’t matter what discipline), it is often harder to make a big career change. It is no secret that college graduates can expect to make a better salary than those without a four-year degree. According to a 2013 study by the Pew Research Center, the difference in median annual earnings between millennial high school and college graduates stands at $17,500. 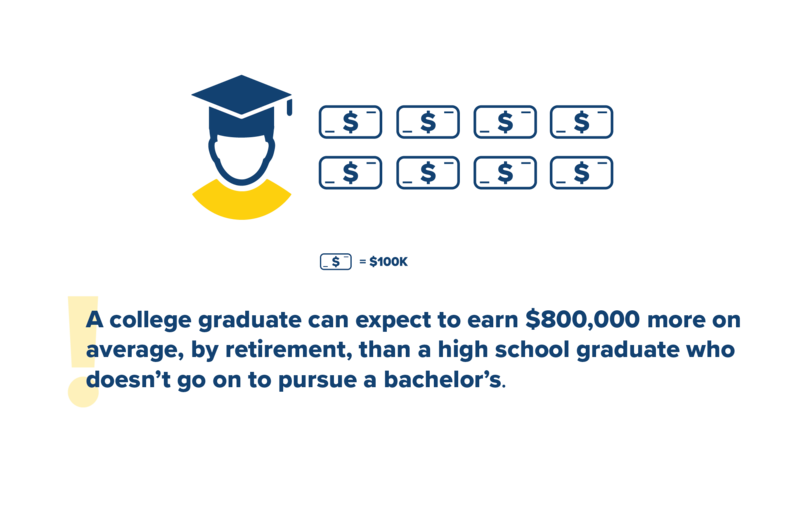 According to the Federal Reserve Board of San Francisco, a college graduate can expect to earn $800,000 more on average, by retirement, than a high school graduate who doesn’t go on to pursue a bachelor’s. Not only does your earning potential significantly increase with an undergraduate degree, but individuals holding these degrees also experience other forms of better compensation. They are more likely to have access to quality benefits such as health insurance, 401Ks and retirement plans, life insurance plans, maternity/paternity leave, vacation and sick leave, paid holidays, cost of living increases, and more. 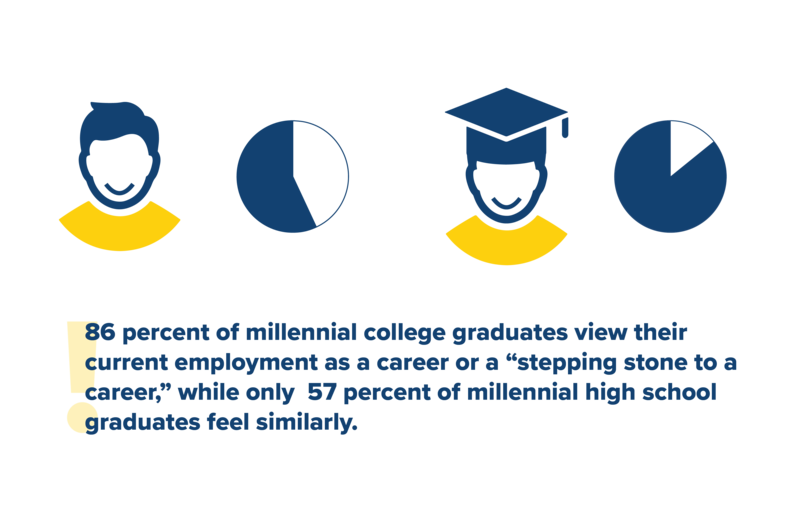 Apart from earning higher salaries and having greater job options and security, four-year college graduates often report higher levels of self-satisfaction when evaluating their employment. A 2008 study done by CollegeBoard found that four-year college graduates reported the highest levels of satisfaction in their job when compared to others with varying degrees of education. But the benefits do not stop at job satisfaction. Four-year graduates tend to be healthier, more productive members of society, and according to a study by Richard Florida and Charlotta Melander — happier as well. Each one of these factors demonstrates, in part, the value of earning a four-year undergraduate degree. There is not just one area in which graduates of a four-year degree program excel, but the data shows that these candidates possess the necessary skills and education to advance in the workforce — and thrive personally. There are many degree completion students who benefit from some form of financial aid. Here are a few financial aid options for students considering going back to school to complete their bachelor’s degree. FAFSA: The financial aid process begins with filling out the FAFSA form, which helps determine a student’s eligibility for federal, state, and institutional aid, as well as certain grants and scholarships. NEED-BASED AID: Students may be eligible to receive funding from various need-based aid programs such as the Federal Pell Grant, Federal SEOG, State Grant, Federal Work-Study, and the Neumann Grant. EMPLOYER ASSISTANCE: Some employers participate in tuition assistance or a tuition reimbursement plan in which an employer pays all or part of any employee’s cost to attend college or university classes. AID FOR DEGREE COMPLETERS: There are also several financial aid opportunities that are open specifically to adults returning to college, such as the Return2College scholarship or the Imagine America scholarship. OTHER FINANCIAL AID OPTIONS: Students in need of financial aid should also consider loans, explore outside grants and scholarships, and contact local banks, churches, and other organizations who might give aid. After you have exhausted these avenues, contact Neumann’s Business Office to talk about payment plans. Prospective students can prepare for continued success in their degree completion program of choice by continuing to work and gain valuable professional experience. If you have the opportunity to participate in furthering your education or certificate training programs, you should take it! Not only do these possibilities make you a more valuable employee, but they can also translate into transferable credits when applying to the program. When preparing to apply to the degree completion programs at NU, students should first contact an Admission professional to begin the process. You will need to complete the Neumann University Application and submit an official college transcript if applicable. An official high school transcript can be submitted if no associates degree has been earned. Students should also compile a list or resume of their work history, work-related training, military experience, and portfolio assessment, all in effort to transfer in as much credit for you as possible. As a student in the B.S. Organizational Studies program, the program is customizable to meet your needs and your schedule. Courses are delivered in an accelerated 7 ½ week seminar format. Students can begin their degree at the start of any semester. Students need to have completed a minimum 30 credits of college course work at a regionally accredited, degree-granting institution, including English Composition I and II, and can transfer in up to 90 college credits. At Neumann University, our community is alive with intellectual energy and creativity. The Faculty who teach the courses in the degree completion program are experts with real-world training and field experience, many of whom are still working in their specific industries. Professors nurture students and help them to grow and thrive by cultivating an environment of questioning, creativity, critical thinking, and problem solving — all of which develop the talents needed for a successful career. Because each professor takes the time to understand where you are coming from and where you want to go, they are able to create an intentional community that builds up students and empowers them to accomplish their goal of finishing their four-year degree. If this environment and these course offerings sound like a place you would thrive, contact our admission office to start your application and learn more about specific degree offerings and requirements. We know you are capable of achieving great things, and we are here to help you see them through!